As a member of Beta Alpha Psi, excellence and achievement are in your blood. 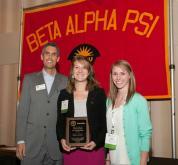 Want to make your chapter proud? Know someone who needs to be recognized for being a rock star? Is your chapter doing something extraordinary? Want to tell the world about it? Contact us and give us all the details.